Happy Friday (TGIF!) I have been busy slaving away over soap, soap, and more soap – working on turning the ideas rolling around in my head into new designs every evening this week, and I finally think I’m ready to start promoting my Etsy shop more.Â I’m focusing the most onÂ “manufacturing” (aka producing in large quantities in my kitchen) and sellingÂ my own designs mostly, though the examples of FANSOAPâ„¢ I’ve made are good to show what I can do in case other companies or small businesses are interested. 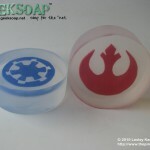 So what are the newest designs of mine in the GEEKSOAPâ„¢ line? 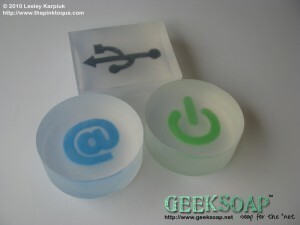 Computer geek soap! Inspired by the geekiness in our household, I’ve created soap that features the universal power (on or off) button, USB icon, RSS feed, and the @ symbol. 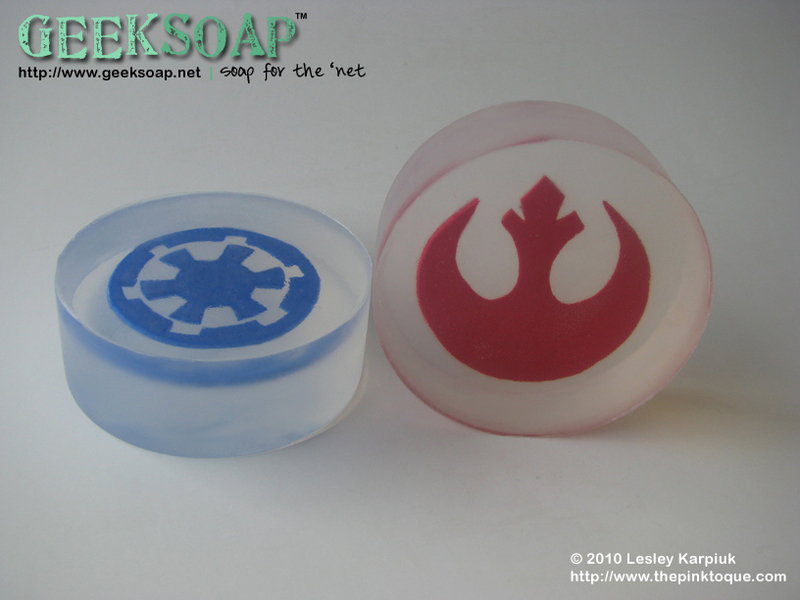 Perfect for the geek in your life (or yourself), these are a symbol of true computer nerdiness that you can be proud to wash yourself with. Today is the deadline for applying for space at the Bloomington Handmade Market in April. I’m nervous and excited because I can’t wait to hear whether or not I’ve been accepted so I can share a table with my cousin’s girlfriend Christine. I’ll keep you posted! GEEKSOAP: Cthulhu, Star Wars, & Batman Soap! It has been a busy crafting weekend! First of all, I’m excited to report that I’ve applied to be considered for space at a booth at the Bloomington Handmade Market coming up in early April. The deadline to enter is Friday the 26th, and then I’ll find out whether or not I’ve been accepted and have a table by March 5. I’m totally excited – if accepted, I’ll be sharing a table with my cousin’s girlfriend, Christine,Â and we’ll be selling our wares to the public in just over a month from now. Not a lot of time, but I’m determined to be ready! So what am I going to sell? 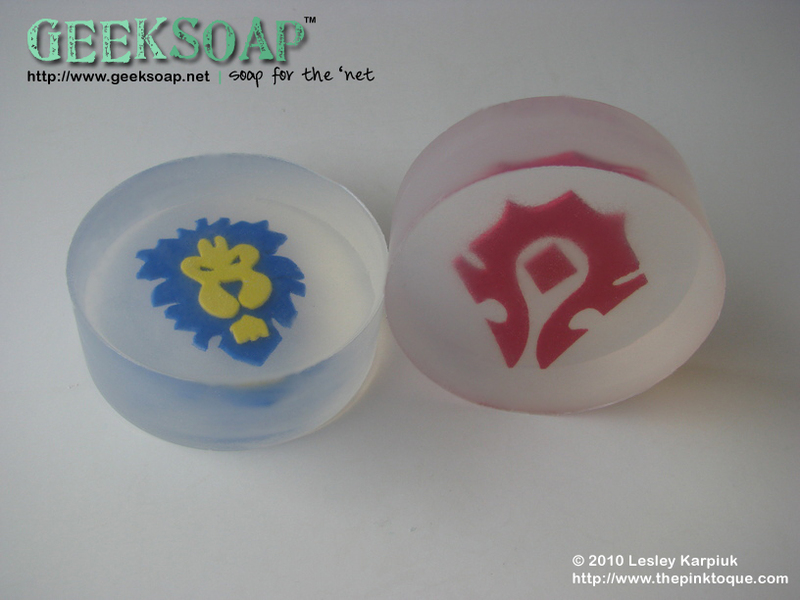 and has plans to include PacMan, Thundercats, and a few other geekyÂ and awesome ideas still rolling around in my brain faster than I can make the soap. 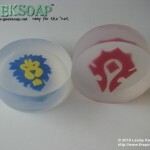 Check out the entire GEEKSOAPâ„¢ line over on my portfolio, which will be updated as new designs are created. 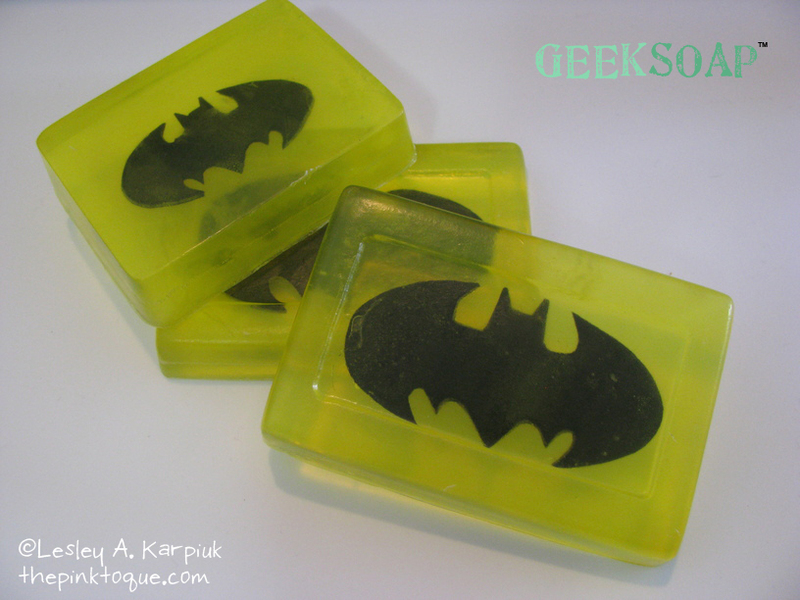 All of my GEEKSOAPâ„¢ varieties will be available on Etsy as well. I’m currently making soap to have as stock to sell at the craft show in April, but I can easily sell it and/or make more for Etsy sales, too.Â It’ll help me see what is popular and what I need to make plenty of in time for the show. Along with the soap I plan to knit up some simple cotton washcloths to have available for purchase. The application for the Bloomington Handmade Market requires either a business website or five photos of your work to help them consider you for space, and so it was another good opportunity to get my craft portfolio site up and running smoothly (something I’ve been meaning to do for months now) to showcase all of the crafty things I do. 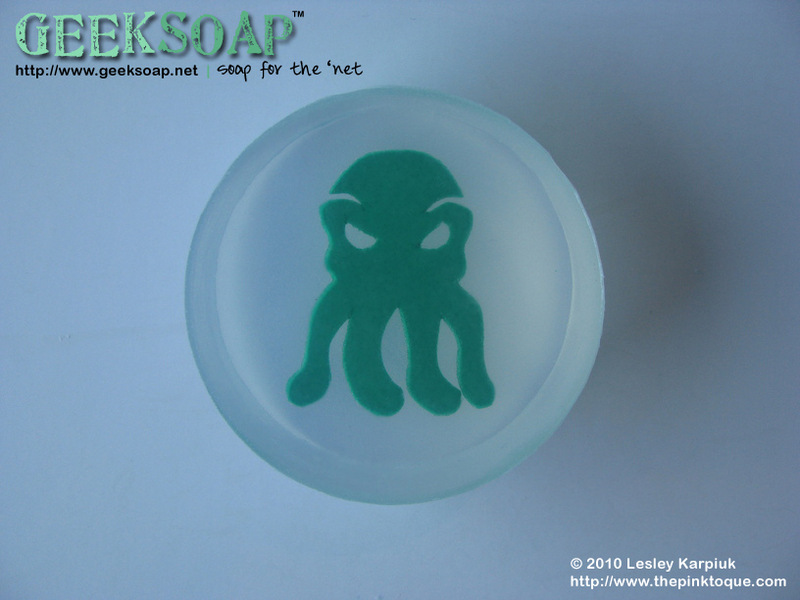 Most notably are the Cthulhu toques, Sock-thulhus, and my GEEKSOAPâ„¢ line. Thanks to my fantastically amazing husband, the portfolio site is up and running andÂ IÂ sent the link along with my application. Introducing…Â ThePinkToque.com! 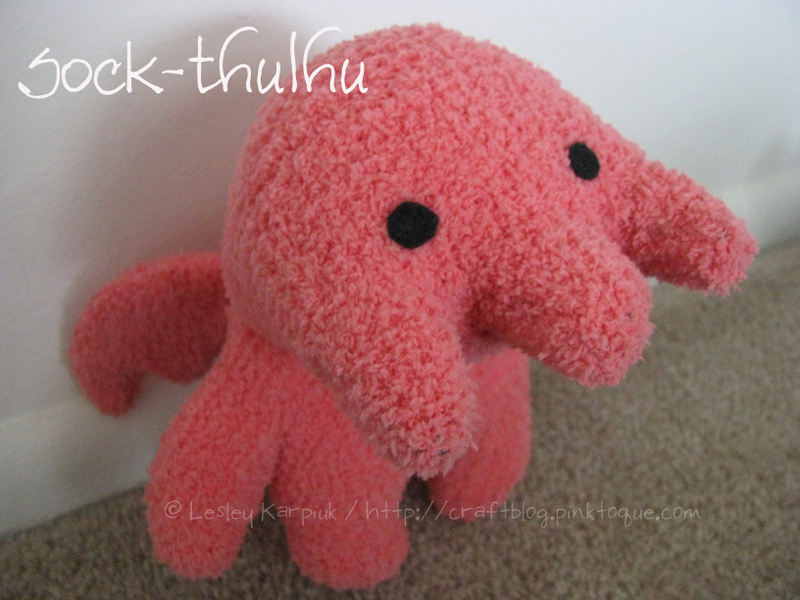 Â The Pink Toque is my online portfolio to show off knitting, crochet, plush, and soap creations I’ve made over the years. Along with being a portfolio,Â the siteÂ then directs people here to the craft blog and to my Etsy shop for more Pink Toque goodness. Let me know what you think! Even if for some reason I’m not accepted for space at the Bloomington Handmade Market, it was at the very least a good way to get me and my handmade business whipped into shape a little bit, don’t you think? You all know how much I love My Memories Suite digital scrapbooking software.Â (Read my review here!) Recently I blogged about the fantastic new Version 2 that has been released, and now I’m proud to shareÂ a discount with you so that you can get your hands on the newest version of My Memories Suite a little more easily. 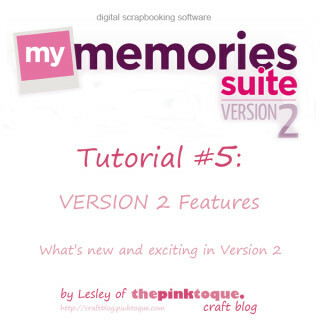 Readers of the Pink Toque Craft Blog can receive a 10% discount off of theÂ very popular (and fabulous)Â Version 2 of My Memories Suite software just by clicking here! Remember that Version 2 of MMS comes with 1500 new background papers, 1300 new embellishments and 20 new layouts. Not to mention all of the awesome new features such as zooming in, WordArt Creator, being able to click and manually rotate your embellishments and photos right on the page, having text follow a shape, and so much more! Be sure to check out all of the great new features of Version 2 that I blogged about a few months back (which includes a video walkthrough!). You’re going to love the facelift that My Memories Suite received with V2! If you’ve been holding back and waiting for a rainy day to purchase My Memories Suite Version 2, now is definitely the time to pick it up at a discount. :) And don’t forget…Â I’veÂ created 5 tutorials for My Memories Suite (including the latest one that showcases the new additions with V2) available to help you get started, and I’m always available to answer any questions you have along the way. So what are you waitingÂ for? Happy Thursday! 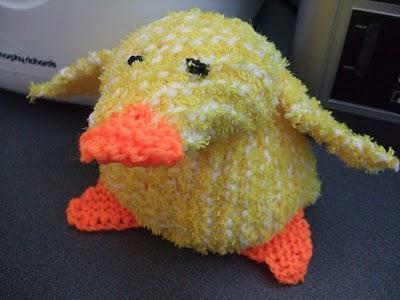 It’s been a little quiet around here lately, but today I’ve got an adorable knitted duck to share with you. Behold! Sharon of Making Stuff (Aka Avoidance of Housework) has knitted this super sweet duck from my free Knitted Duck Plush pattern. [also onÂ Ravelry]Â Didn’t it turn out lovely? I heart Sharon and all of those who share pictures of what they’ve made from my patterns. It gives me such a warm, fuzzy feeling inside!Â Thanks, Sharon! Speaking of Sharon’s blog, you just HAVE to check it out. All of her baking (wow, look at her blog banner… it looks good enough to lick the monitor screen!) looks so delicious. I love how beautiful her Battenburg turned out and I am definitely trying out her Fougasse recipe. Yum! Â Plus… she has a PINK kitchen! It doesn’t get any better than that. 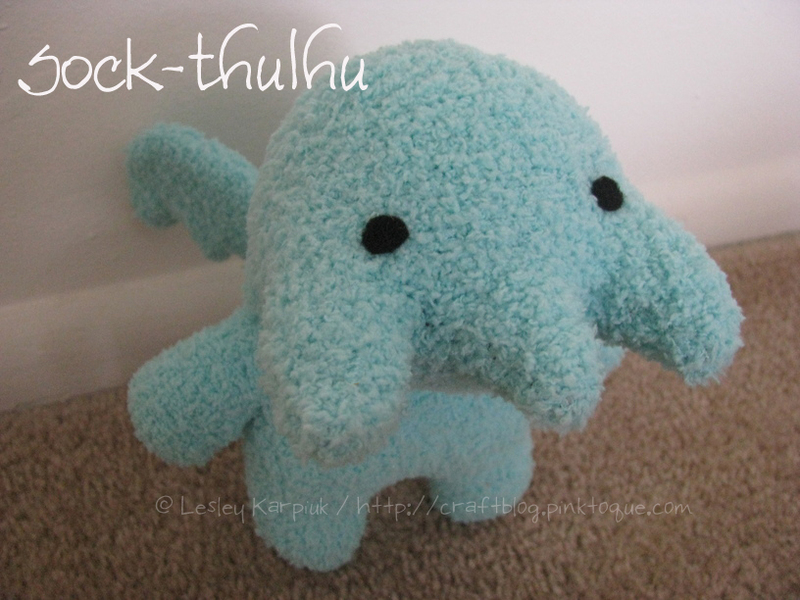 Forget sock monkeys — YOU need an original Sock-thulhu! Sock monkeys are sooooooo 1930s. 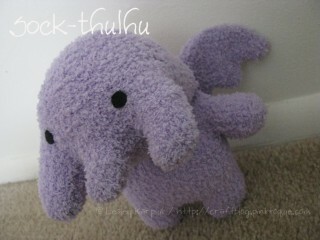 What you need is one of my original designs: the Sock-thulhu, a Cthulhu plush design Ã la sock monkey. Made from soft, fuzzy chenille-style socks and stuffed with polyfil, Sock-thulhus will steal your heart with one look or a beat of their gently reinforced wings.Â While socks and Cthulhus have gone together before, the Sock-thulhus’ pattern and construction is like no other and produces a one-of-a-kind plushy delight perfect for cuddling. 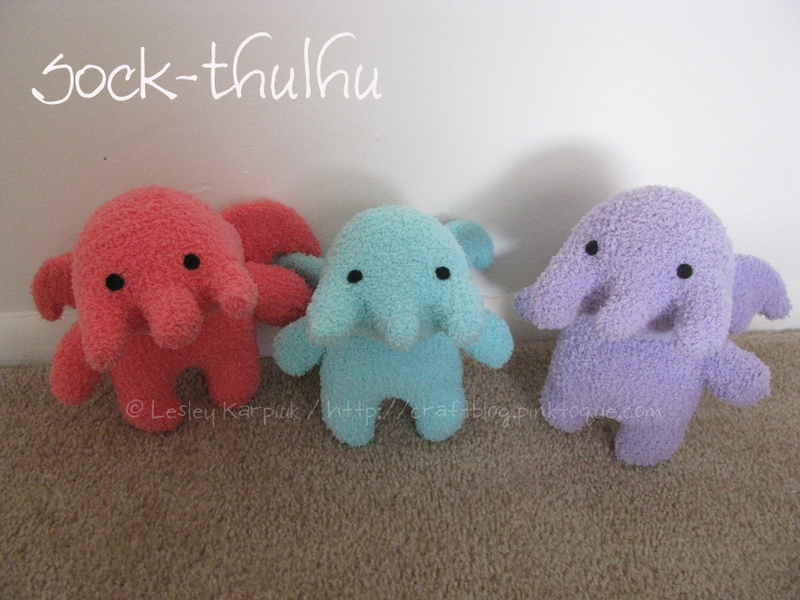 Sock-thulhus stand around 6 inches tall. You can buy one in my Etsy shop! Currently I only have three: one mint green, one purple, and one orange. I hope to get a blue and pink one up soon and more to come as well. I’m a Craftster Best of 2009 Winner! Wow, I am so completely honored: I am a Craftster “Best of 2009” winner! Back inÂ February 2009Â I was featured on Craftster for my handpainted custom Mah’jong set that I made for Lucas. As amazing as that felt, I never dreamed it would also make a Best of 2009 winner list, too! I’m blushing and beaming all at the same time, if that’s possible. Thank you so much to those that made it happen. To determine winners, CraftsterÂ pickedÂ the top 10 projects posted in each crafty category in 2009 that got the most replies and views and then whittledÂ those 10 down to their favorite top 5. Each crafty category has 5 winners to represent the best of that category’s 2009 projects. Be sure to click the image above to see ALL of the absolutely fantastic winners in all of the Craftster crafty categories. You’ll find my Mah’jong set in the last categoryÂ listed underÂ Toys & Games. Thanks for alerting me to this feature, Craftzine! :) I am so blessed. 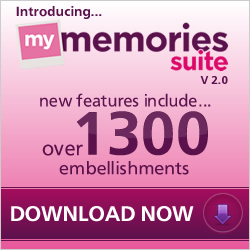 Happy Sunday, and have I got a treat for you… introducing My Memories Suite VERSION 2! That’s right, you heard me correctly. Not only is there a new version to My Memories Suite with all new features, I created a video tutorial to explain it all and show those new features off! Last month, StoryRock unveiled an all new version 2 of its famous and very popular digital scrapbooking software, My Memories Suite. Version 2 is packed with all new goodies and awesome new features that we were dying for in Version 1. It’s like StoryRock read all of the feedback of features and ideas that its users over the years have been wanting out of the software and put it in one neat little package that will make digital scrapbookers the world over very happy. If you’ve been to the Pink Toque Craft Blog before, you know I am an avid user of My Memories Suite. I got the software over 3 years ago when it first came out, and I have been in love ever since. I don’t want to babble on forever (because the new Version 2 goodies are exciting!) but if this is your first visit to my blog and you’re wondering what all of the excitement is about and why I love this software so much, be sure to go and read my review. My Memories Suite has been the best digital scrapbooking program to ever come along and with Version 2, it just got better. Version 2 includes 1500 new background papers, 1300 new embellishments and 20 new layouts that come built into the software for your use right out of the box. On top of that, new features such as the zoom ability, Resource Gallery, and WordArt Designer make creating beautiful digital scrapbooking pages even easier. My favorite new feature is that your text can now be curved and follow shapes. This was not something you could do in Version 1, and I love that I can create text in beautiful circular shapes or to follow the edges of a photograph right on the page. It was probably the most requested feature and question I got from readers of my blog. Before I had to tell people they could only do something like that in Photoshop, but now My Memories Suite allows you to edit curved and rounded text on the fly right in the program instead. Hooray! Another highly-sought-after feature that a lot of people asked me about was how to view pages side-by-side so they could build double page spread layouts. Unfortunately, this was not something you could do in Version 1, but now in Version 2 it’s easy. You can also now share your digital scrapbook in a wider variety of ways, including trading cards or calendars. They’ve also streamlined the Photobook process to make it easier to create beautiful photobooks of your finished albums. You’ll also love that you can click and rotate your pictures right on the page. I received Version 2 last month and have been trying hard to squeeze in some digital scrapping time with it so that I could show off the new features here on my blog. I finally got around to it today, and created a new video tutorial that highlights all of the major new features available to you in Version 2. I walk you through the new things and how to use them, and it makes it easy for Version 1 users to pick right up where they left off in the old version, or for new users to My Memories Suite to see just how awesome the software really is so they can get it for themselves. Version 1 users will love that all of the photo albums and pages they’ve created in Version 1 will be converted for them into Version 2 compatibility and that the transition will be seamless. You won’t lose anything and all of your old albums will be right there for you in Version 2, ready to go and waiting for you to use the new tools and features to enhance them even further. When you’re adding embellishments or papers, you’ll be able to easily see what items are new to Version 2, and all of the old embellishments and papers from Version 1 are collected together in a folder labeled as Version 1, so you can quickly find all of your old favorites or check out the new stuff. Speaking of Favorites, another new feature that I just love is that I can “bookmark” the embellishments and papers that I use most often and mark it as a favorite. This means that it’s added to a special “favorites” folder so I can access those favorite items quickly anytime I want to without having to search for them every time I want to use them on my digital scrapbook page designs. I show how this works in the video tutorial. The WordArt Designer allows you to create fun and professional looking word art for your pages easily, and is built right in to the side tab of My Memories Suite now. Type in the text you want to create into word art, select the font and sizing, line spacing, colors, fill, stroke, etc. You can add shadows or a bevel and design the perfect word art accompaniment to any page you’re working on. I also demonstrate this in the video tutorial! Enjoy! Be sure to let me know if you have any questions or comments on the new video tutorials or you need help with My Memories Suite Version 2. Hope you’ve had a great weekend :) Happy scrapping! Merry Christmas! I hope you and yours had a wonderful holiday. I’m excited to finally be able to share the goodies that I knit up for family and friends this season. First on my list is to share what my husband knit for me. Yes, you read that right! It was Lucas’ mom that taught me to knit in the first place, over 3 years ago. Last May when I was trying to figure out what to knit for our dads for Father’s Day, Lucas asked me to teach him to knit so that we could both knit socks for our dads together. What a keeper! 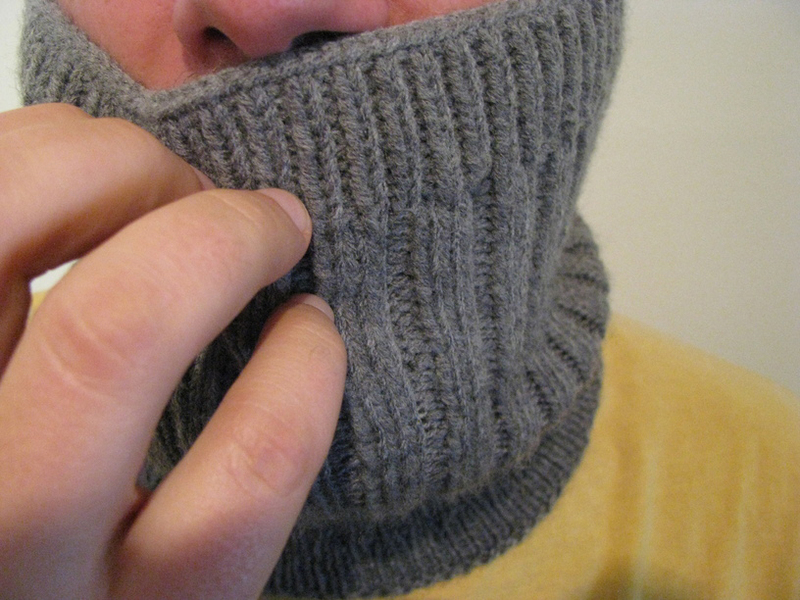 For Christmas this year, he knit me a beautiful, beautiful cables and eyelets cowl. It’s the same pattern I used to make a cowl for my step-MIL this year, too. I remarked about how much I loved it and he knit me one. When he gave it to me, he said, “Thanks for teaching me to knit.” Awwwe, what more could a girl ask for?! I am a lucky, lucky girl indeed. I plan to knit a matching toque on our little road trip to Toronto tomorrow. At work this year I participated in a Secret Santa drawing, and I loved it! I got the art teacher, who is a friend and fellow knitter. She and I and the home ec teacher together created a knit/crochet group for other teachers in our building. It was so much fun having a knitter for a Secret Santa! 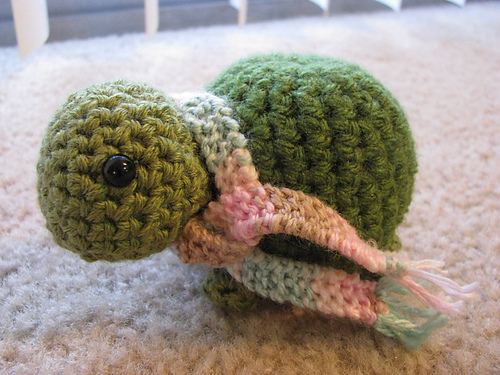 I made her a tiny crochet turtle one of the days because she loves turtles (complete with a tiny knitted scarf!) 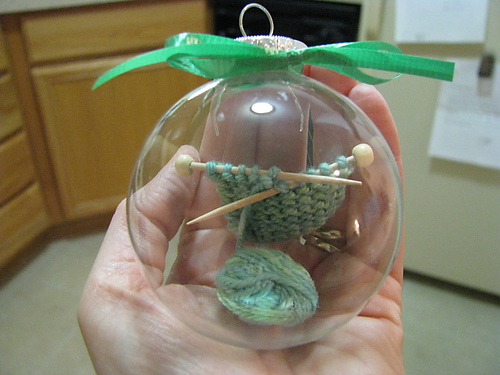 and a knitter’s ornament on another day, and then her final gift was a set of Fetching — fingerless mitts. 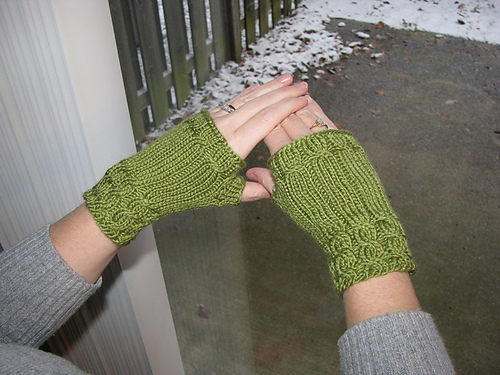 It was my first attempt ever at doing gloves/fingerless mittens and I had so much fun! They worked up quickly and beautifully. I need a little practice on picking up stitches, though, because I felt my thumbs were a bit messy, but overall I was really pleased. And the recipient loved them, too. 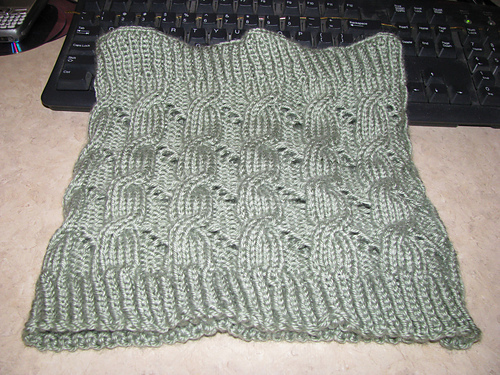 For my mom, I knit a gorgeous Column of Leaves scarf. It took me nearly a month to do, but that was because I kept putting it aside to finish gifts for out-of-town family that had to be shipped first. The pattern repeats were simple and I was able to get into a groove with it. 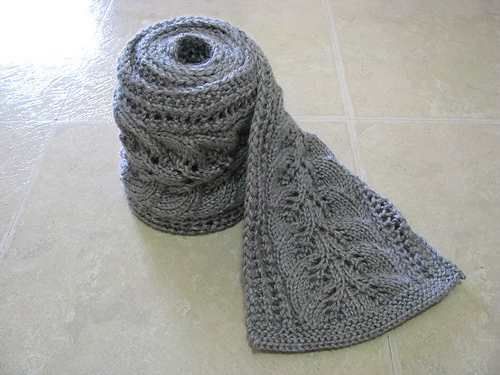 I would knit the 8 row pattern repeat 5 times a day for around a week to get the finished length of around 56″. It was well received, and the first non-boring garter stitch scarf I’ve made my mom. I like that I feel like I’m becoming more of an intermediate knitter this year and attempting to tackle (and complete) more advanced projects that include (gulp) lace! It’s really not as hard as I thought it would be. Speaking of moms, I knit a Cable & Eyelet Cowl for my step-MIL and a slouchy beret-style hat for my mother-in-law this year. I was really proud of the turn out for both of them. It was my first cowl, and suddenly I wondered why I had never knit one before; so much more interesting than a scarf, I think. (Watch out mom, you may get a cowl instead of a scarf next year!) I enjoy knitting in the round and I love knitting toques, so a cowl was like knitting a toque without the decreases at the end, and I was in heaven. I’m weird I know. 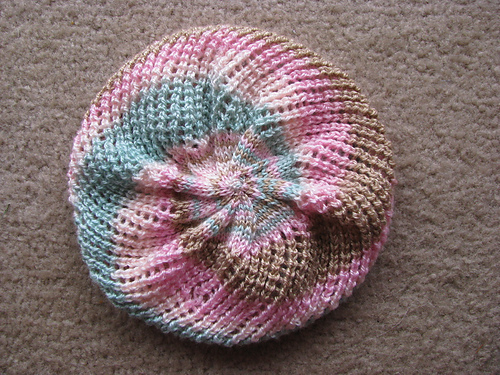 The slouchy toque was my first attempt at such a design and while I don’t think the style fits me, I think it will be absolutely lovely on my mother-in-law.Â I wish I could pull off the beret style! Lucas helped me to pick out the colors I used and I think she’ll be really happy with it. For Lucas I knit up a new toque. I had crocheted him a toque and scarf set last year, but I wanted something that was a little more stylish than a simple single crochet beanie. 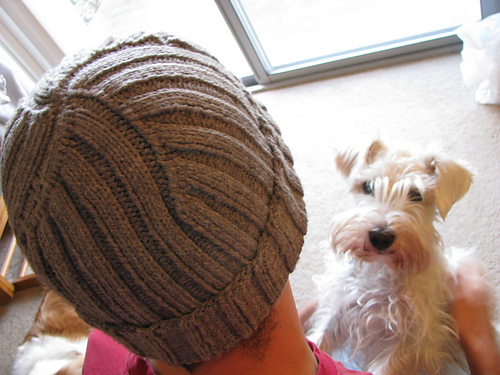 (Not that there’s anything wrong with a single crochet beanie!) 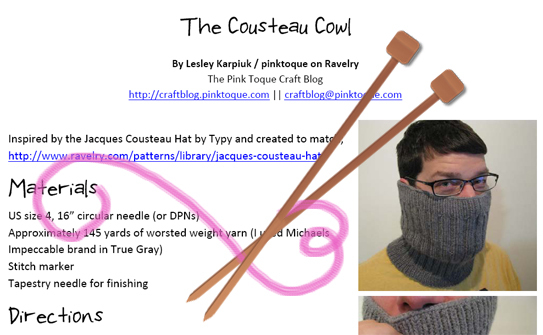 When I saw the pattern of the Jacques Cousteau hat, I knew it was the one.Â It was a really simple rib the entire length of the toque, which is easier said than done; my poor fingers were so sore afterwards! I’m sure it had more to do with how I gripped the knitting to try and keep even tension when switching so often between knit and purl stitches, but still. It was totally worth it, though! I loved the look of the decreases at the crown. 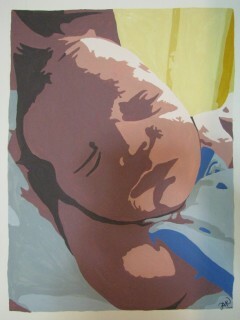 And last but not least by any means is the gift I made for my brand new nephew, William. My brother and sister-in-law love all of the Disney Cars themed stuff for him (my brother is a mechanic, I predict Will loving cars just as much as his daddy does!) 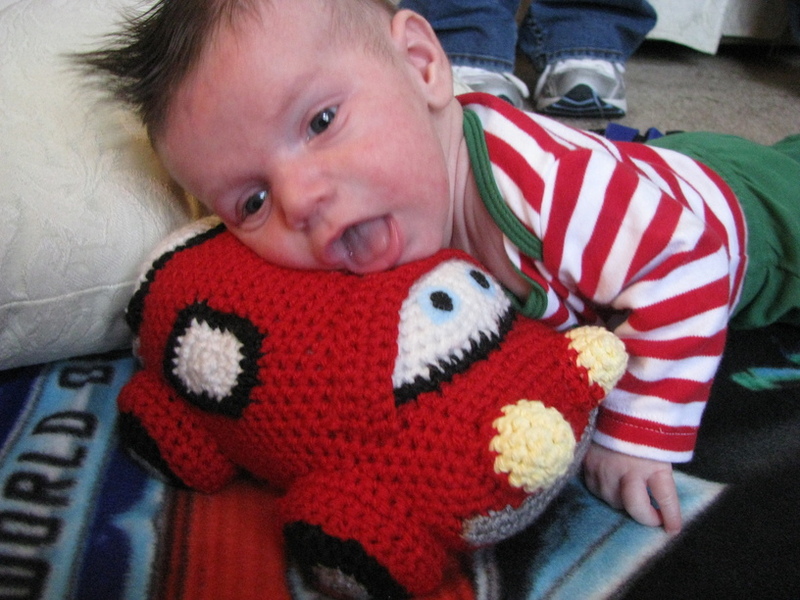 and so I purchased this fantastic Little Car pattern from Delicious Crochet on Etsy and created a stuffed amigurumi car for Will. Isn’t it adorable?! It was so much fun to make and he was so cute with it on Christmas morning. Whew! It was a busy, busy holiday season. Now Lucas and I are off to Toronto and I can relax with a little knitting for myself on the drive there and back. I received the fantastic Harmony wood interchangeable set from KnitPicks from my parents to go along with my nickel-plated set, and I can’t wait to take them for a spin. :) Happy Holidays! I’ve recently finished a Christmas gift for my brother and sister-in-law, and since I know they don’t read my blog, I figured it would be safe to share it. Mostly because I’m very proud of it, and can’t wait to show it off some! Behold, a painting I did of their new baby, my new nephew, William. William was born at the end of October and is just the cutest little thing ever. He’s the spitting image of my little brother, and I’m so proud of both Herman and Holly on their gorgeous firstborn. I thought something to help preserve this special time and the precious memory of their son being so young and new to the world would be a great Christmas gift. I wanted to paint them something, but realistic paintings of humans just isn’t one of my strongest skills. Instead, while playing around in Photoshop with about a dozen of the 239835893467379845 pictures I’ve taken of Will lately, I came across a filter that produced a really great “cut out” abstract shape version of the photo, and I realized… I can paint this. And you know what? You can do it, too! First, you’ll want to open up an image in Photoshop. Under the Filter menu at the top, select “Artistic”, and under the Artistic menu options, choose “Cutout.” This will turn your image into a collection that rolls solid shapes and shading all into one. It’s kinda abstract-ish yet you’re still able to tell what’s going on. Try this with several different pictures because depending on the lighting and shading of the photo you’ve chosen, some will turn out better than others when filtered. Now it was time to paint. I spread out on the kitchen floor with my art board and some cheap craft acrylics. We’re talking the $0.99 craft acrylics you can buy at Wal-Mart, nothing fancy. Next I simply used the printed photo as a guide and filled in the shapes I’d outlined with solid color. I didn’t have to worry about shading or anythingÂ complicated; it was all simple shapes. The more color I got filled in, the more the painting came alive.Â All in all, from filtering the photograph and tracing it on the art board against my wall, to filling in the final stroke of color with my paintbrush, the portrait took me 5 hours. The completed painting is around 2 feet wide by 2.5 feet tall and I’ve framed it in a nice dark wooden frame to gift to my brother and sister-in-law. 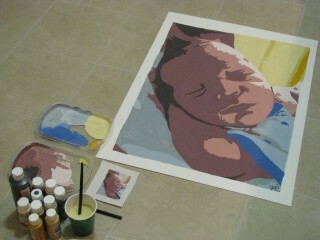 I’m thinking it will look lovely on a wall in the baby’s room or even in the living room of their home. It was super easy to put together, and even if you have no artistic abilities, you’ll be surprised at how much easier this project is to complete if you think of it as simply filling in shapes instead of creating a portrait. If you can color in the lines, you can do this! Also, can you believe that Christmas is just around the corner? Sometimes I think these holidays purposefully blindside you to keep you on your toes and make sure you were paying attention. While I’m not 100% finished with all of the gifts I’m creating for friends and family this season, I can see the light at the end of the tunnel. Christmas cards will be going out soon and I can’t wait to share them here because the family photo used is really adorable. :) Best of luck with your Christmas crafting!